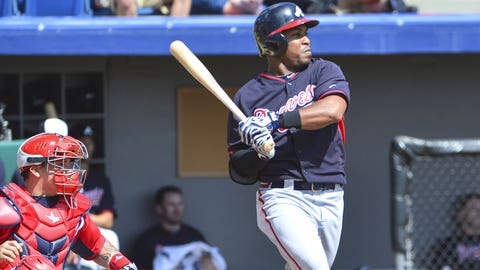 Jose Constanza (one RBI, two hits, two runs) and the Braves collected all 15 of their runs between Innings 3-6 -- including a nine-run explosion in the 5th. VIERA, Fla. — Jordan Zimmermann breezed through two shutout innings with only 20 pitches for the Washington Nationals in what turned into a wild, 16-15 win over the Atlanta Braves on Saturday. Zimmermann, who tied for the NL lead with 19 wins last season, gave up one hit and struck out one in his brief appearance. The right-hander had a lot of success with his changeup last year and was pleased with the pitch on Saturday, particularly in the first inning when he got Atlanta’s Freddie Freeman to ground out. Zimmermann seemed to surprise Freeman by throwing a changeup on a 1-0 count. "He kind of looked at me like, `Really? We’re starting this already?’" Zimmermann said. "It got to 3-2 and I figured it was the last thing he was looking for. I threw a pretty good one. It was up a little bit, but he rolled it over I got a groundball, so it was good." Atlanta and Washington combined for 31 runs on 37 hits, including 11 doubles. There were six errors, five by Washington, and a combined 14 walks. Mike Fontenot drove in four runs and Tyler Moore had three RBIs for the Nationals. Jordan Schafer went 3 for 3 and doubled twice for Atlanta. Matt Lipka had three hits and four RBIs. The scoring came mostly in the middle innings. It was 2-all after the third, and 16-15 after the sixth. The Braves got nine runs in the top of the fifth to take a 14-6 lead, but the Nationals rallied with five runs each in the bottom of the fifth and sixth innings — while only getting three hits. Braves: Julio Teheran threw two scoreless innings, striking out one and giving up two hits while tossing 30 pitches, 21 for strikes. He was particularly happy with his slider, which he used to strike out Anthony Rendon in the first inning. "It was exciting to come back on the mound and do what I expect — just throw strikes," Teheran said. "In the offseason I’ve been trying to (perfect) my curveball and my slider. I think this year is going to be different because of the all the experience with my slider." Braves: Outfielder Justin Upton is expected to play Sunday against the Astros. He felt soreness in his right side and was scratched just before last Wednesday’s spring opener against Houston. "It was nothing major, and we wanted to keep it nothing major," Braves manager Fredi Gonzalez said. Catcher Gerald Laird, who has been experiencing back spasms, is expected to play either Sunday or Monday. Nationals right fielder Jayson Werth will play his first game of the spring on Sunday, when right-hander Doug Fister takes the the mound for his new team against the Miami Marlins. Manager Matt Williams announced lefty Ross Detwiler will start Monday’s road game against the Yankees. Righty Stephen Strasburg will make his first spring start on Tuesday against the Braves. Gonzalez expects good things from Washington’s new skipper. "I think he’ll make a damn good manager, I really do," Gonzalez said of Williams. "I don’t know him at all. I’ve been around him at third base when I coached third and he played third. Pretty intense man." "When he started coaching, he was real cordial, really professional guy. I think he’s a no-nonsense type of guy. Knows the fundamentals. Plays the game the right way. When he was a player, it seemed like he held his teammates accountable for stuff," he said. "I suspect that will transfer over as a manager, which is a good trait to have."